The Romanian historian Nicolae Iorga played a critical role in the history of his country for more than fifty years until his tragic death in 1940. The author of more than 1,200 books and 20,000 articles, Iorga was one of the most prolific scholars of all time. In recognition of his academic achievements, Iorga was made a member of the Romanian, French, Yugoslav, and Polish academies and received honorary doctorates from universities throughout the world. In addition, he was deeply involved in the political life of Romania throughout the first four decades of the twentieth century, one of the most complex and important periods in his country’s history. 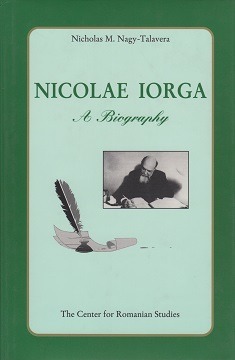 This book, the first comprehensive biography of one of the most important European cultural and political personalities of the first half of the twentieth century, considers Iorga not only as a historian, politician, journalist, literary critic, playwright, writer, poet, and linguist, but also as an orator, a teacher, and last, but not least, a human being. Written by a leading American scholar and based on archival sources and family documents, this book is the first biography to present a complete portrait of the world renowned historian Nicolae Iorga. Nicholas M. Nagy-Talavera is professor of history at California State University, Chico.